Recently, I posted to my Instagram story, asking those who follow me for suggestions on future blog topics. And, knowing a little bit about my story and my struggle with OCD/anxiety, a friend asked that, if I was comfortable, I would share how I manage it. For those of you who don’t know me, or are new to my blog, I’ve struggled with OCD/anxiety on and off since around middle school. My struggle with OCD/anxiety is mostly a battle of the mind (to borrow a term from Joyce Meyers). It can look different for different people, but for me it mainly takes the form of thoughts. Thoughts that make me feel stressed, or that trigger my emotions in some way. When this happens, it often triggers a host of physical symptoms – symptoms like a racing heart, or the sensation of ‘tensing up’ under stress. The thoughts, mixed with the symptoms, brings us to what most people would dub “OCD” or “anxiety. And while, dealing with this kind of anxiety can be hard, it isn’t impossible. I believe that through Christ’s power living in us, we are more than conquerors through Christ who strengthens us (Romans 8:3). And as intense as anxiety can sometimes be, it is no match for the God who breathed earth into being and breath into our very lungs. And, here are some tips that have helped me overcome my own anxiety. 1. Identify the source – “The thief comes only to steal and kill and destroy; I have come that they may have life, and have it to the full.” – John 10:10. Back when I was in middle school, one of my youth leaders made us memorize this verse. I can still remember being in a line of middle schoolers waiting to recite it back to her to get a piece of free candy. Years later, as an adult, I am super glad that I learned it. Because as Christians on fire for Jesus, our enemy is constantly looking for ways to defeat us, and keep us from the plans that God has for us. One of the primary way that he will do this, is through using anxiety to defeat us—putting thoughts in our minds and making us think that they are ours. He will also lie to us in any way that He can—about ourselves and about the people that God has placed in our lives. When these kinds of self-defeating thoughts come, it is important that we identify the source. 2 Corinthians 10:5 says, “We demolish arguments and every pretension that sets itself up against the knowledge of God, and we take captive every thought to make it obedient to Christ.” When our knowledge of God’s truth becomes more powerful than the lies that we hear about ourselves, we are in a place where we can begin demolishing these thoughts and the anxiety that comes with them. 2. Surround yourself with a community – “And let us consider how we may spur one another on toward love and good deeds, not giving up meeting together, as some are in the habit of doing, but encouraging one another—and all the more as you see the Day approaching.” Hebrews 10:24-25. I honestly cannot speak enough about the importance of community in the life of the believer. I fell into a season a while back where I struggled to find this, and it was honestly one of the worst times for me in regards to anxiety/OCD. When we surround ourselves with people who will speak truth into our lives and encourage us in our faith, it is so much harder for the enemy to lie to us and attack us with temptation and troubling thoughts. There’s a reason that God tells us to surround ourselves with other believers. It is not only good for our Christian walk—it is good for our mental and emotional wellbeing. 3. 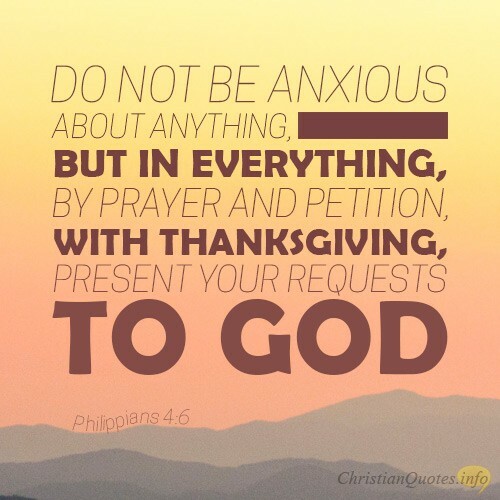 Pray – “Do not be anxious about anything, but in every situation, by prayer and petition, with thanksgiving, present your requests to God.” Philippians 4:6 I know this one probably sounds so cliche, but trust me, it works. This is not to say that if you pray, all of your problems will automatically be resolved – after all, Paul still had his thorn even after he asked God to take it away (2 Corinthians 12:7-9). However, this does not diminish the power of prayer. Praying changes something in our hearts, even at the times that we struggle. It causes us to position our hearts towards God and ‘cast all of our fears unto Him because He cares‘ (Psalm 55:22). God is with you even in your hardest moments. When we begin to praise God in the storm, anxiety slowly begins to lose its power over us. Suddenly, the things that we were once so worried about, and that we were so stressed out about seem small—by comparison of the amazing, awesome, and powerful God that we serve! A God who is greater than any form of fear or anxiety! 4. Be Real—not perfect -“But he said to me, “My grace is sufficient for you, for my power is made perfect in weakness.” Therefore I will boast all the more gladly of my weaknesses, so that the power of Christ may rest upon me. For the sake of Christ, then, I am content with weaknesses, insults, hardships, persecutions, and calamities. For when I am weak, then I am strong.” 2 Corinthians 12:9-10. Ironically, just last week, as I was planning this blog post, one of the other leaders at my church’s youth group was asked to speak on this very topic. And one thing he mentioned that stood out to me was letting go of the need to be strong and be perfect—opening up to God and others about our areas of weakness. As your classic ‘type A’ perfectionist, this can definitely be a struggle for me. It can be hard to say to a friend or someone close to you ‘I’m not OK.’ However, as God taught me over the course of last year, one of the healthiest things that we can do as human beings is confide in each other, and be real about our struggles. We are all human, and there is not a human on this planet who has their life completely figured out. 5. Get in the word – “For the word of God is alive and active. Sharper than any double-edged sword, it penetrates even to dividing soul and spirit, joints and marrow; it judges the thoughts and attitudes of the heart.” Hebrews 4:12. Staying plugged into God’s Word is one of our surest keys to keeping our anxiety and negative emotions in check. It has the power to break through the deepest places in our heart and penetrate through our whole being. A couple of days ago, I woke up feeling stressed about the future, and trying to discern God’s plans for me, and as soon as I broke out my Bible and put on some good worship music, I felt better. As Christians, the Bible is our lifeblood, and it is so important that we stay in the Word to steady our spirits as we go throughout our day to day lives.